LAHORE: Pakistan’s mango exports to the European Union (EU) markets are expected to start from this week after the Directorate of Plant Protection (DPP) ‘temporarily’ waived the requirement of getting the MRL (maximum residual level) tests of the (exporting) orchards done prior to shipment of their consignments. “We have informed the exporters that they can start shipping their consignments to the EU countries without the MRL tests,” DPP Director General Mubarak Ahmed told Dawn by phone on Tuesday. But he clarified that only those consignments would be allowed to be shipped that have been procured from the registered orchards. The DPP has so far registered 40-50 orchards in Sindh, where the harvest starts in May. 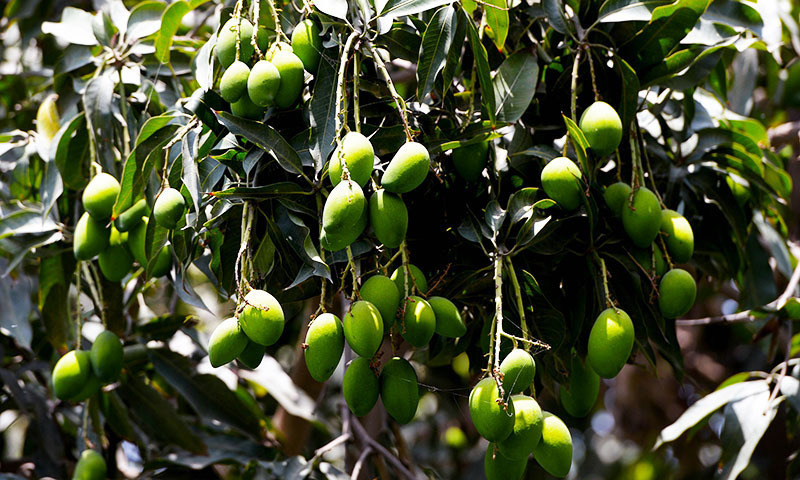 The mango farms in Punjab will be registered after the harvest starts over the next few weeks. The DPP DG was certain that the registered farmers would easily clear the MRL tests. “We have registered only those farms where the quantity of the chemicals sprayed was within the limits prescribed by the tough EU food safety regulations,” he said. If any orchard fails to clear the MRL test, the DPP DG said, it would be immediately stopped from exporting because the breach of the food safety standards of importing countries could jeopardise the entire mango exports from Pakistan. Last year, the EU had placed ban on mango imports from India after consignments from there were found to be contaminated by fruit fly. The ban on India’s sweet yellow fruit had greatly helped Pakistan boost its exports to Europe. Pakistan’s mango exports rose to 93,000 tonnes last summer. This year the exports are projected to increase above 100,000 tonnes. Shoaib Sheikh, a Lahore-based fruit and vegetables exporter, was critical of the government for not making timely arrangement for the MRL tests. He said the DPP’s decision to register only a handful of orchards for EU had already triggered a sudden rise in the mango prices in Sindh. Syed Hasnain Ashar Ashi, President of the All Importers Association in Norway, advised the Pakistani authorities to ensure that all snags in the way of mango exports to the EU were removed without further loss of time. “They must realise that the delay in the delivery of shipments to the stores and retail chains in the EU countries is as harmful for Pakistani mango exports as fruit fly or any other pest,” he told Dawn from Oslo by phone. How fortunate are EU consumers who can avail of the most amazingly delicious mangoes in the world - Pakistani mangoes which have no equal. Now what about Pakistani mangoes for long-suffering Pakistani diaspora in the USA? It's not fair that only EU and Canada should have access to these heavenly treats .. please Pakistani mango growers - we need Langra, Chausa and Sindhri .. please? Send those mangoes to me, please! MRL tests must be restored. In case one shipment is rejected, entire mango industry and name of the country will be defamed. Who will be responsible in the latter case. There is a minimum amount of pesticide spray on mango generally in Punjab. Farmers often used pheromone traps to control fruit fly (which is environment friendly), therefore, MRL testing is less likely to harm mango export. There are couple of research laboratories at Faisalabad (like NIBGE and NIAB) who have all the facilities to test pesticide residue in fruit/food. These institutions can be reached out for pesticide residues testing.